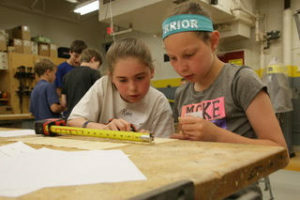 From throughout St. Paul, 24 youth participated in this year’s Kids at Work, a summer program for students in grades 4-9 that combines the fun of Science, Technology, Engineering and Math (STEM) with activities focused on the construction building trades industry. Kids at Work is one of several programs designed to introduce young people to careers in construction offered through Construction Career Pathways, a statewide effort funded by the constriction industry, trade unions and the state of Minnesota. From July 16 to July 27, 2018, students met at Johnson High School in Saint Paul to complete hands-on projects in the classroom, take field trips and tour construction job sites. Over the course of the program, students were introduced to many construction trades and types of projects, from designing bridges out of popsicle sticks, to touring the plumbers shop at Saint Paul College. 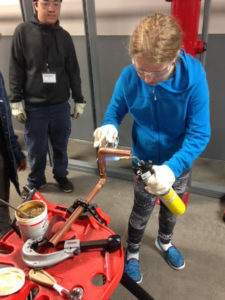 “They learned how to make marshmallow shooters with professional plumbing techniques,” says Vicki Sandberg, the Kids at Work program leader. “Kids at Work is all about developing skills in a fun way. 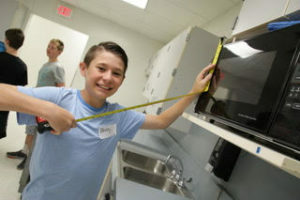 Much of the program is focused on learning to work with teams in the classroom, giving the students a chance to get to know their classmates better and develop valuable skills. Students also complete projects on their own, such as building a toolbox out of sheetmetal that they can take home. In the process, they discover work ethic and gain independence. Construction Apprenticeship Preparation (CAP) schools provide students with hands-on learning opportunities in the construction building trades career fields while using the Multi-Craft Core Curriculum (MC3). The curriculum supports a variety of different classes designed to introduce high school students to the construction industry in an engaging way. Because the Kids at Work summer program is only two years old, it’s still too early to clearly understand the extent of the program’s impact on students. However, enrollment numbers are rising steadily and interest in Kids at Work is growing. Rick Gale, the training director and apprenticeship coordinator for the Plumbers and Gasfitters Local 34, says the most important impact that the program can have, from someone who has worked in the skilled trades for most of his life, is simply to introduce the idea that there’s much more to the skilled trades than most of us think. While working with a group of students in the Kids at Work program, Gale explained that plumbing is a lot more than just toilets and sinks. While it may be too soon to understand the impact on students, the program is helping educators more aware of career options available to their students. Along with their teachers, the students participating in Kids at Work are getting interested in the construction industry and what their futures could hold. At first, according to Sandberg, not all of the students could see a future for themselves in construction. “The students had several different summer programs to choose from through the St. Paul school system, and more than half of them didn’t list Kids at Work as their first choice,” Sandberg says. After the first day of the program, students were given the chance to switch out of Kids at Work and join another class. “Only one student chose to switch out of Kids at Work, and the rest decided to stay and keep having fun in an engaging environment where they could work with their hands,” she explains.